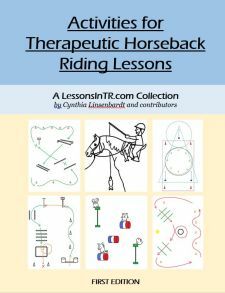 Today’s Teaching Tip comes from the Advanced Workshop I attended, regarding teaching to groups with very different functioning levels of riders: Teach to the Highest Level, Then Adapt. (As opposed to teaching to the lowest level of rider ability in group.) The reasoning behind this is that by teaching to the highest level, the lower levels may learn and attempt later. Don’t assume that the lower functioning riders don’t understand, they may hear and understand perfectly but not be able to do it…yet. Sandy Webster gave the analogy of handicap racing – you try to make the field even. 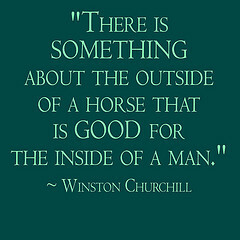 In therapeutic riding you do this by giving the lowest functioning riders all the support they need to be as successful as the rest, and give the highest functioning riders the challenge they need to progress by peeling away the support. For example, take teaching the skill of halt to walk transitions. Rider 1 is high functioning, so have him use all four aids. Rider 2 is nonverbal and has little use of his limbs, so have him use weight aids by looking up, and leg aids with volunteer assistance. Rider 3 is nonverbal and moderate functioning, so have him sign “walk on” and use leg aids. Please kindly regard my informal nontechnical rider descriptions! The point is how you can adapt the same skill for all levels of riders, after first teaching all the aids. I found that extremely helpful, and I hope you do too!